President Dan Schulte of Pieroth Wine Korea. The Seoul Times recently met with President Schulte and heard about his passion for wine and the strategies of his promoting wine in the local market. The following are the questions and answers with him. Q1: First of all, on behalf of all The Seoul Times staff, I would like to congratulate you on your successful launching of your Pieroth Wine Korea, although belatedly. How long have you been in service in this Korean market? How and why did you start Pieroth Wine Korea? A1: Thank you and it's a pleasure to be here. I've been in Korea for about 9 years now actually. Previously I was with a publishing company and ran that office until last year. After getting there sales up to a point of maturity I decide to move on. Pieroth signed me on last year as they had been looking for someone to start their Korea office. I decided to take on the project because wine has always been a bit of a passion of mine, and I know that the Korean wine market has been growing in recent years. The "try before you buy" approach of Pieroth wines is a new and unique one and I think it will work well in Korea. I just couldn't resist the opportunity to be a part of that. Q2: Correct me if I am wrong. There are some 5,000 different kinds of wine circulating in Korean market now. Compared with other wines what are the characteristics of your Pieroth wines? How special are they? A2: The biggest different between Pieroth wines and "commercial" wines are that you wont find our wines in supermarkets or wine shops. All of our wines are actually "boutique" wines, so production from our vineyards is much more limited in order to concentrate more on quality rather than on quantity. As a result our wines are exclusive only to our customers only- which are private wine drinkers and select restaurants. In most cases our customers are able to try the wines before deciding to buy them. This means that our wines are put to a much higher standard than normal wines- rather than just depending on a pretty label or "clearance" sales, our wines actually have to taste good! I imagine that if the supermarkets allowed you to try every wine before buying them, there would be a lot of unsold bottles sitting on their shelves! So I guess our wines are special because of the service and care that go into them- all the way from the vineyard to the wine lover! Q3: According to the local wine industry the wine market will grow by 23-25 percent this year compared with last year. Competitions among the wine importers are equally fierce in their marketing, I suppose. What is your goal this year and what is your marketing strategy? A3: Yes competition among the various importers is quite fierce as you say. Our strategy for dealing with this is to simply stay away from it. Almost all of the importers are trying to sell to supermarkets, wine shops, wine bars and of course restaurants. These companies are going more for the big bulk sales, and selling only commercial wines manufactured in mass quantities. I have no problem with letting them fight over that chunk of the market. Most of our customers are private drinkers- regular wine drinkers that demand a higher level of quality in their wine. Our restaurant and wine bar customers are similar in that they want wines that are special and not available in the open market. And my goal for this year? Simply to survive! Like any new business, we are finding our way around day by day and learning from our mistakes. However I have to say that reaction from our customers has been very positive and things are moving along ahead of schedule. 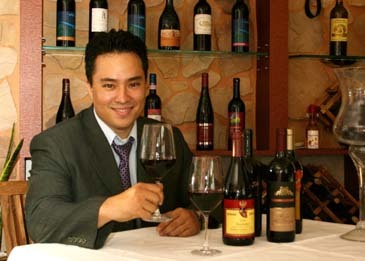 Q4: Tell me about your long-term plan for Pieroth Wine Korea or for other business plans if you have any? A4: We have many plans! All top secret thought I'm afraid! Just kidding- actually my plans include many different types of businesses, all related to wine education and wine tasting. 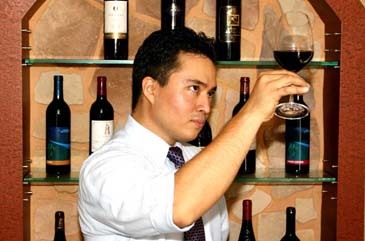 Over the next few years I hope to open a Pieroth Wine Academy where students can learn about wines in a casual and less stuffy atmosphere than the standard sommelier classes. 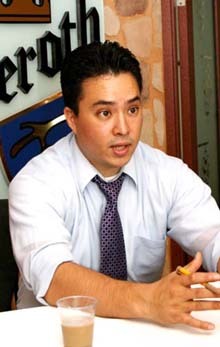 I also plan to open a chain of Pieroth Wine Bars, where customers can try all the wines on the wine list by the glass and learn about the wines through more interactive approaches like highly trained waiters and waitresses, etc. This I believe would be much more popular than the standard wine bars that sell the same wines you can get from the supermarket, but charge three times more for them! Q5: Still some Korean people consider drinking wine is a luxury habit. What do you think about some Korean people trying to stick to their old tradition of drinking soju all the time? Do you think more Koreans should start drinking wine? A5: Should more Koreans drink wine? OF COURSE! But seriously, the question about Koreans drinking soju and how it affects us is one I often get. I honestly don't think this will ever go away, though I do think you will see less of it in the future. And that's because the purpose of drinking soju is simply to get drunk quickly and cheaply. I don't think I have ever met a Korean that is willing to keep a drink of soju on their tongue like they would a glass of wine! I think that soju serves its purpose well in these situations, and it most likely always will. Q6: As I am aware of you are very active in holding a variety of events to promote your wine. Please introduce some of the most interesting or most meaningful events you have already hosted or plan for the future. A6: One of the most recent events we had was our Pieroth Wine Cruise, with our cosponsor The Seoul Club. This was a hugely successful event and we definitely plan to continue this event and others like it. We are planning lots of different events that will give wine lovers the opportunity to not only learn about different wines around the world, but also to try them! And most recently we actually havd two really interesting events. "Utilizing 5 key asset classes to achieve financial success"
The presentation was made by Robert Williams, managing director of IFG Asia, part of the IFG Group PLC, a global financial services organization specializing in wealth management solutions. Robert flew in from Japan to give us a "tour" of global markets and how to utilize different asset classes to achieve financial success. After his presentation, I then presented a wonderful range of top quality wines from around the world for our guest's enjoyment. They tried our latest wines from France, Italy, Germany, Australia, and South Africa! Q7: If you do not mind, I would like to give you personal questions. Tell me about your family. Do you have any special background in your upbringing? What do they do? What made you start you business here in Korea? 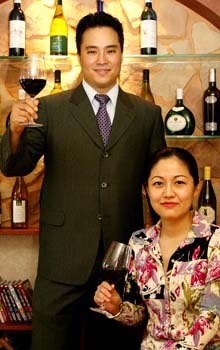 President Dan Schulte (left) of Pieroth Wine Korea poses with Miss Michelle Kim, Pieroth's PR manager. A7: I'm not sure about a "special" background, but I guess I have more of an international upbringing than most. Being an army brat, we never really stayed in one country for too long. I was born in Germany, then lived in Korea, then Germany again, then finally to America. This along with being half Korean, I had the opportunity to experience different cultures and languages as I grew up. Although my family is still in California (my parents are retired), after graduating from college it just seemed natural to move again for me- I moved to Japan to learn the language and after a couple years returned to Korea. One thing these experiences have taught me is that most misunderstandings in international business can be traced back to cultural differences. Understanding this is the key to success in international business in my opinion. So I started this business here simply because it's a fascinating market with lots of potential and I can't imagine myself anywhere else. That and I love a good challenge! Q8: What do you think about Korean people in general and Korean culture compared with Western one? What are the merits or demerits of the Korean people? What aspects of Korean culture need to be corrected or improved in order for its culture to be regarded as sophisticated and advanced one? A8: Wow that's a tough question! Let's see… how do I answer this without offending my Korean clients out there…. The Korean culture, like any culture, has its good points and bad points. It's tough to compare it with Western culture since that might force me to choose which is better. While I don't think that's possible, I can say that I love the energy of the Korean people and how they seem to tackle problems with such motivation. This is obvious when you look at the Korean economy and its rapid growth, as Korea continues to moves steadily towards being a fully economically developed nation like Japan. If I had to choose the "demerits" of Korean people, I think it is important that they keep moving towards what I would consider international trends towards such issues as smoking, pollution, etc. I've some improvements in these areas but there is still a long way to go. You still will often see garbage being tossed nonchalantly aside by pedestrians, or spitting in the street, even when a garbage can is nearby. This along with other things such as driving habits that make just crossing the street a life threatening event, and piles of garbage on streets that seem to take weeks to get picked up, are currently challenges that need to be dealt with in order for Korea to be considered a "sophisticated" culture as you say. These habits are slowly disappearing as the younger, more internationally traveled Koreans take the place of the older generation so I think it is all just a matter of time really. Q9: Many of the Korean people are binge drinkers as else where in the world. After a long day of work they go out with fellow co-workers for drinking, sometime second or third round. What are the habits of Korean drinkers in general? What are positive or negative aspects of their drinking habits? A9: Yes Koreans, like many Asians, look at alcohol simply as something to drink until you are drunk. Sometimes it seems like the whole country is just one big College campus! In Korea's case I think this is related to the influence of confusion values on Korean culture. Respect for ones elders and for someone of a higher rank in the company is important and so alcohol is seen as a way for people to relax and talk more, with the "excuse" of alcohol being handy in case they cross a line. For business, this makes drinking and getting drunk a good way to bond and will often help solidify contracts during negotiations. As a result, drinking alcohol slowly (as you would with wine) is not the normal way of doing things. There is no doubt there can be positive aspects to this drinking culture, and one could argue that business would be very difficult in Korea without it! But the obvious negative effects are the health problems that can come with over drinking, as well as the danger of being drunk and alone in the early morning streets of Seoul. We have probably all seen the guy in the street that is so drunk that he can't even stand up, and we've probably all wondered why their "friends" left them there! Q10: What do you do for relaxation or release your stresses? What are your hobbies? Do you exercise? A10: My biggest passion (besides wine!) is exercise and weight training. This is my best way of relieving stress and I always feel better after a good run or workout. I think it's important to remember to exercise in a place like Seoul that can be incredibly stressful and upsetting if you let it get to you! Perhaps that is why I have stayed this long and why I still love it here. You have to find a way to deal with the negatives and take advantage of the positives!